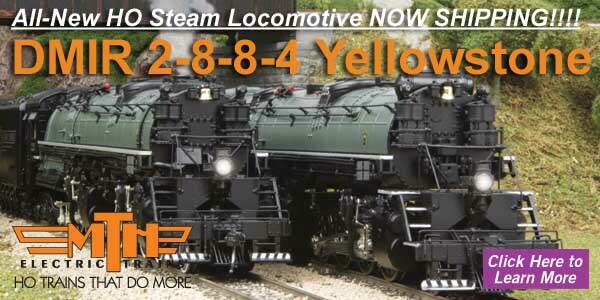 All New HO Scale Yellowstone NOW SHIPPING!!!! February 3, 2016 - M.T.H. Electric Trains has released its all-new HO scale DMIR 2-8-8-4 Yellowstone articulated steam locomotive first announced in the Fall of 2015. This all die-cast metal locomotive - the seventh articulated locomotive and 20th overall steamer in the firm's fleet - comes fully equipped with digital sound, a 28 F-Function DCC Decoder, built-in speed control, synchronized puffing smoke, all LED lighting and an operating remotely triggered Proto-Coupler. These limited production releases can be ordered through any M.T.H. Authorized Retailer or directly from M.T.H. by clicking on any of the item numbers to the left.